Harbers Trucks, a full service Volvo Truck Commercial Vehicle dealer in the Netherlands, has supplied St van den Brink with fourteen Volvo LNG trucks for its logistics fleet. With this, the transport company from Ermelo underlines its focus on sustainability and innovation. The order consists of 12 Volvo FM LNG 4 × 2 tractors with 420 hp and two Volvo FH LNG 4 × 2 tractors with 460 hp. There are several reasons for choosing LNG trucks, explains owner Alex van den Brink. The purchase contributes to the company’s goal, formulated in 2008, to reduce CO 2 emissions by at least 20%. Drivers are also enthusiastic about the driving comfort and performance of the Volvo LNG trucks. 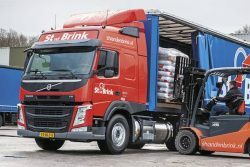 The fact that the trucks are powered by an engine that uses the diesel principle without compromising on driving characteristics, efficiency and reliability is an important reason for Van den Brink to opt for Volvo’s LNG solution. “This sets Volvo apart”, says Van den Brink.